After a few horrid weekends of freezing and wet conditions, it was a joy to catch up with a couple of girl friends over dinner. 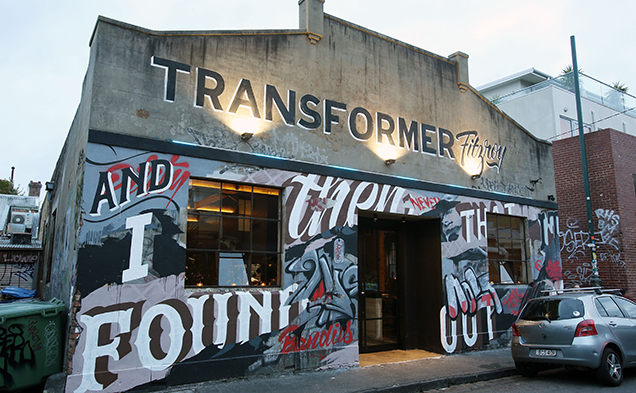 Our destination: Transformer Bar and Restaurant in funky Fitzroy. 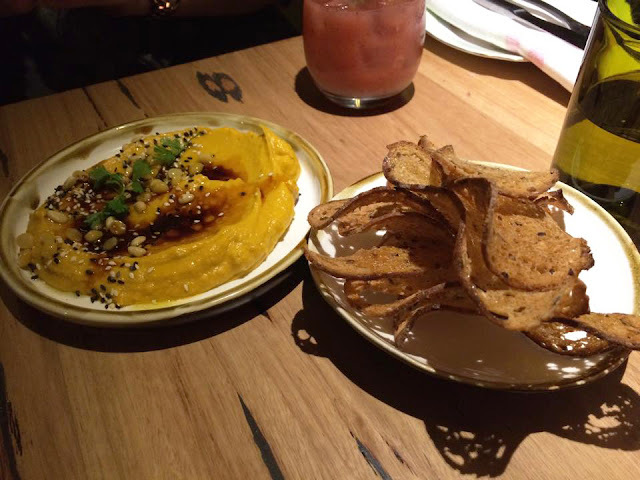 Located in Rose Street, just off Brunswick Road, Transformer is the more sophisticated sister of Vegie Bar. No Autobots here (Sorry..) but lots of brass and timber fixture, not to mention the abundance of greenery that create an intimate dining space. 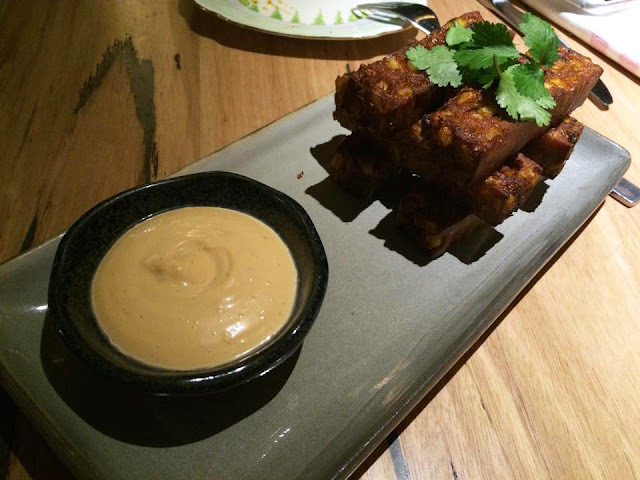 Just like Vegie Bar, the food here is all vegetarian. If you, like me, wrinkles up your nose at the mere mention of “vegan,” Transformer will definitely turn that wrinkle into a contented Om. Seriously, over the course of our meal, not once did I miss the taste of meat, which was often my case with vegetarian food. 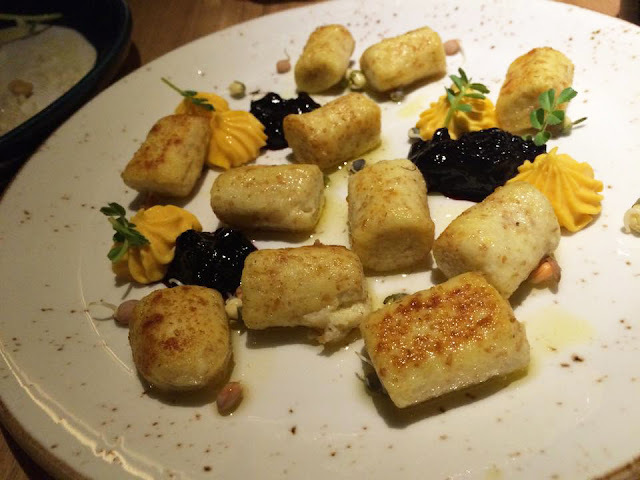 In fact, the experience at Transformer has made me rethink about vegan food as “bland,” “boring” or pretentious. 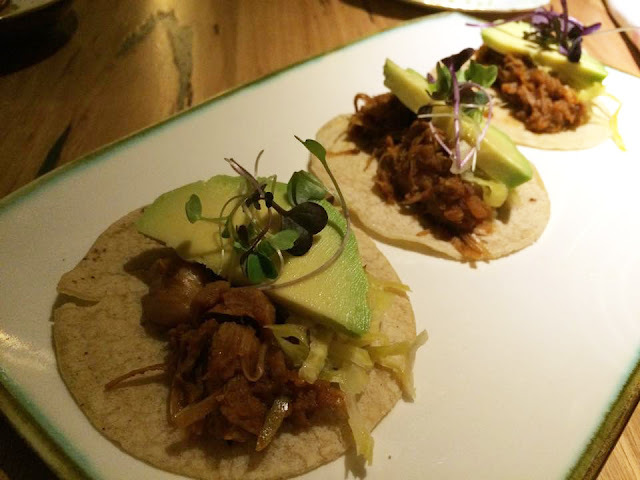 The menu at Transformer draws inspiration from Mediterranean, Asian and Mexican influence, with its own special twist. As with most trendy eatery these days, the dishes come in small, sharing plates and Transformer recommends 2 or 3 plates per person. If you’re uninitiated to vegetarian food or feeling adventurous, you can also let the chef pick out the dishes for you, for $45 per person, which was what we did. Velvety, creamy, sweet. It’s like hummus without garlic and a delightful starter. This was my highlight of the night. I’ve had heaps of jackfruit in Malaysia before and its sickly sweet taste and smell never appealed to me. So I was incredibly impressed and surprised by how they made a fruit tasted and looked like pulled pork. In fact, the texture was exactly the same as pulled pork. I'm still obsessed with corn fritters and these were delightful - crispy on the outside, fluffy and sweet on the inside. I LOVE mushrooms and these were probably the best I had in a long time. It was earthy and smokey. 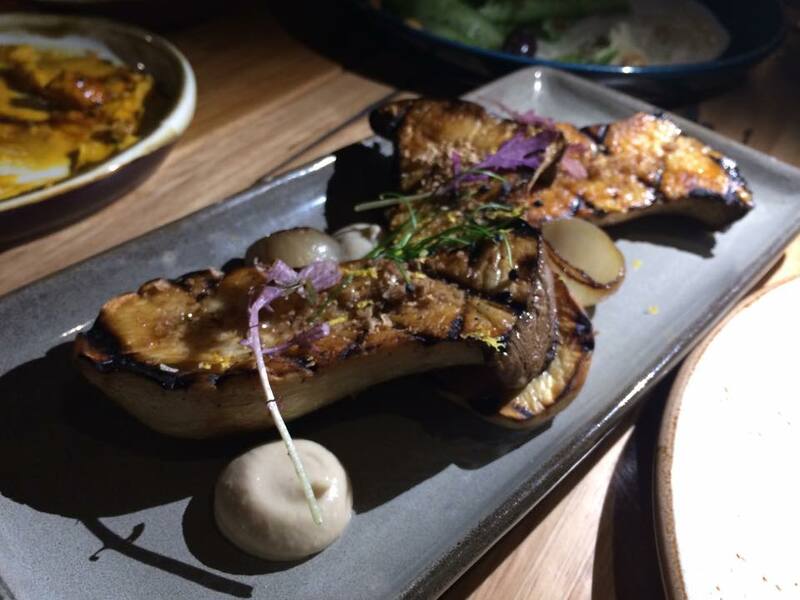 Forget about the condiments, I could have the mushroom by itself. This was one of the highlights of our dinner. It was the perfect blend of savoury and sweet with the smooth pumpkin mousse and the sweet/sour notes of blueberry compote. 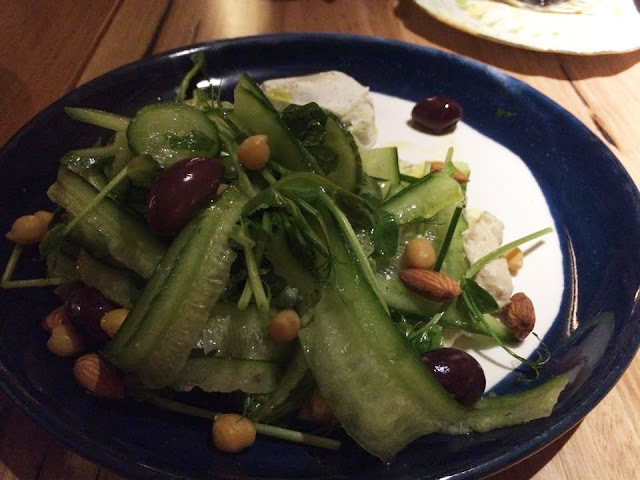 It's a lovely-looking plate of fresh salad. OK, it was good, but not as exciting as the rest of the dishes. I'm so sorry I don't know what else is on the dish, except that it is delicious! 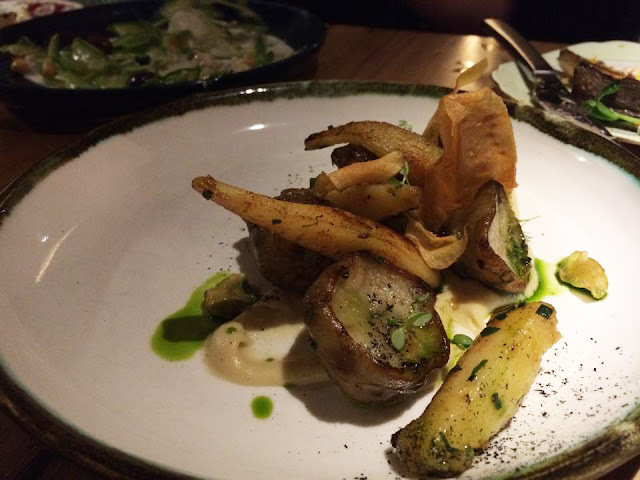 I'm not familiar with artichoke, but I do like the flavour, and it's also beautifully presented. After being served with dishes that was rich in flavour and texture, it was great to wind down the dinner with this Japanese-influenced soba noodles. The ginger gave a needed zing, but the wasabi cashews were simply delicious. I can imagine a jar full of them in the kitchen pantry. Oh how I would love to grab a handful and snack on them! We skipped desserts because we were told, rather abruptly, that we could only dine until 8:30pm. 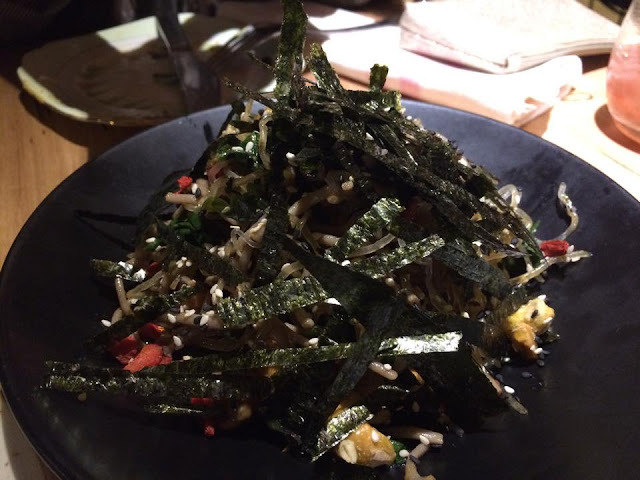 Although the waiter we had serving us was somewhat condescending and kept hurrying us along, the food was lovely and we did not want someone's negativity to influence our experience. Given the chance, I will return again...just for the mushroom.